The creed of Imam al-Tahawi (D. 321AH), Bayan al-Sunnah wa al-Jama’ah, commonly known as the al-‘Aqida al-Tahawiyya is the masterpiece on the ‘Aqida of Ahl al-Sunna wa al-Jama’ah penned by the renowned 3rd Century Theologian, Muhaddith and Jurist, Imam Abu Ja’far Ahmad ibn Muhammad al-Azdi al-Tahawi al-Hanafi. It is the widely accepted ‘Aqida work dealing with the beliefs of Ahl al-Sunnah wa al-Jama’ah (Sunni Islam) stemming back over a period well exceeding a millennium. Tahawi’s “Doctrine” (al-’Aqida), though small in size, is a basic text for all times, listing what a Muslim must know, believe and inwardly comprehend. There is consensus among the Companions, the Successors and all the leading Islamic authorities such as the four Imams and their authoritative followers on the doctrines enumerated in this work, which are entirely derived from the undisputed primary sources of Religion, the Holy Qur’an and the confirmed Ahadith. Being a text on Islamic doctrine, this work sums up the arguments set forth in those two sources to define sound belief, and likewise, the arguments advanced in refuting the views of sects that have deviated from the Sunnah. In this audio compilation, Shaykh Dr. Abul Hasan Hussain Ahmed (hafidhahullah), explains the points in the text with relevant evidences from the Qur’an, Sunnah and the sayings of classical scholars; with an outline of some of the various deviant sects that arose and those who departed from Ahl al-Sunnah wa al-Jama’ah in their claim to adhere to this very text especially in this age of mass confusion. The legacy of the Prophet Muhammad (may the peace and blessings of Allah be upon him), his sayings, actions and tacit approval remains in the hearts of millions of Muslims around the world today. His pure example is practiced across the globe by people of all colours, cultures and races. The codification of Shari’ah (Islamic Law) is based primarily on the Qur’an followed by the Ahadith (Traditions) of the Prophet (peace and blessings be upon him). The science of Hadith extends more than a millennium and is not an effortless science to Master. There are many branches within it which further divide into sub-branches, which goes to show the intricacy and ardour of scholars throughout the ages, who have dedicated their lives in the preservation of the Prophetic Traditions. 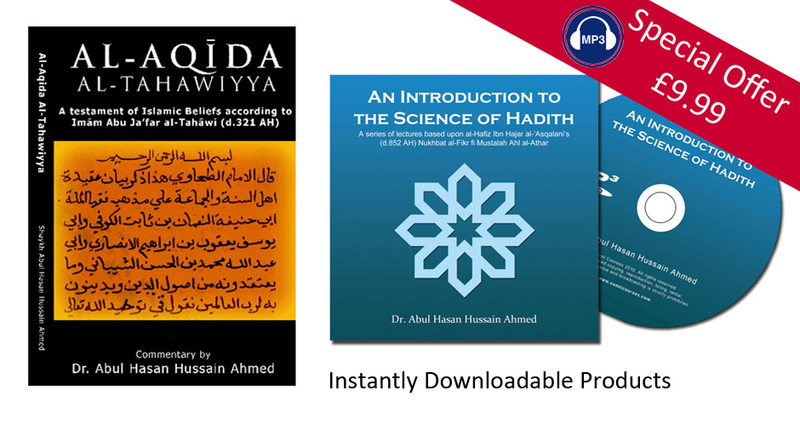 In this audio compilation, Shaykh Dr. Abul Hasan Hussain Ahmed (hafidhahullah) has illustrated an oral introduction to the Science of Hadith. The keen student will get to grasp the basic preliminary level of ‘Ulum al-Hadith with the aid of an attached PDF file entitled “coursepack.pdf”. The course is on parity to that of the 8th century Imam, Shaykh al-Islam ibn Hajar al-‘Asqalani’s (D. 852AH) work “Nukhbat al-Fikr”. I would like to buy the Cd on ‘Introduction to the Science of Hadith’ by Shaykh Dr Abul Hasan Hussain Ahmed. Please let me know, if this available and how i can purchase it.